Come visit the beautiful flower and plant farms of Monterey Bay! Ever wonder what beauty lies behind the glass in a greenhouse? Now’s your chance during the 9th Annual Monterey Bay Greenhouse Growers Open House on June 9th! 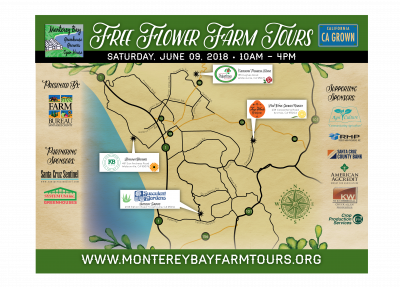 There will be an array of flowers, herbs, and plants to see ranging from roses to gerberas, succulents and more while touring these Monterey Bay farms. This event is FREE and open to the public thanks to our sponsors. Visit www.montereybayfarmtours.org for more information and to download the map!